1. Reduced or avoided impacts? There is some conflict between the goals of the two funding departments: on the one hand reductions of energy use and climate emissions (DECC), on the other poverty alleviation (DfID). ELITH’s goals therefore needed some reformulating. This is because achieving absolute reductions in energy use and climate emissions cannot be a valid objective when addressing the poorest sectors. We, the rich, may and indeed must reduce our footprint, by efficiency gains as well as reduced consumption; but the poor need access to more energy and resources – space, heat, cooling, lighting, transport, as well as increased public services. Improving their quality of life may be possible at no added cost whilst achieving energy reductions in some cases; but in most cases this will not be so. Yet the energy/climate objective is equally valid when reformulated; it is mainly preventative. This is because the greatest growth in energy use and climate emissions is amongst the upwardly mobile, rapidly urbanising populations. Hence, the goal is to address the huge growth in energy use and emissions if these sectors follow a conventional development path. 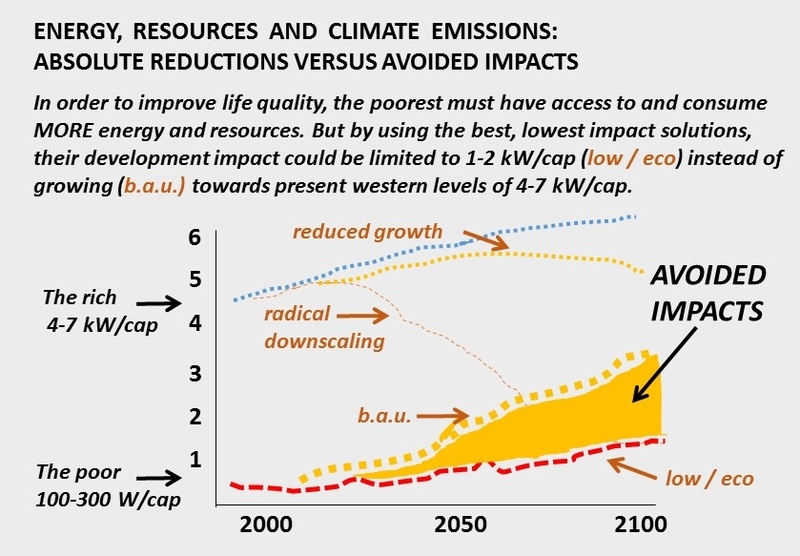 The goal is thus mitigation; not absolute reductions but avoided impacts. Poverty is relative; not least in relation to energy. Our partner countries represent very different contexts. Low income in Africa can mean below the level of having any energy supply at all, whereas in the fast developing Asian economies it might mean below the level of access to mechanical cooling. The major energy growth today, and hence our principal focus in China and Thailand, is amongst the urbanising lower middle income segment. Whereas this tendency is worldwide, even in Africa, poverty alleviation in rural Africa may mean access to a first light bulb. Relevant research tasks are thus very different. Hence, goals depends on context, both climatic, socio-economic and cultural. In Thailand for example, absolute poverty is now quite rare; in China it still exists but may be sensitive if not inappropriate for outsiders to focus on; in African countries there is often little knowledge or planning capacity. As noted, in the African context our focus is on simple low-income housing, whilst in the Asian context it is not on the bottom of the pyramid but on mitigating the rapidly growing energy/climate footprint of the new urbanising populations. Comfort is also relative. Western standards, such as ASHRAE, are not always applicable in hot climate cultures – where higher temperature and humidity are perceived as comfortable. And international (for example WHO) norms will be unrealistically costly to achieve in low-income situations. Our goal therefore is to achieve improvements in indoor comfort for the poor – not absolute standards. To provide comfort with mechanical cooling implies an energy supply – which may not exist in African or other rural contexts. But to achieve comfort without energy is difficult in tropical climates where design with passive means will often not be sufficient. Hence our research addresses two cases. In the Asian context of rapid urbanisation, where energy amenities are available and households do have significant funds, the goal is solutions that reduce the need for mechanical cooling to a minimum, and then to apply energy-efficient technical solutions. In Africa or in typical slum contexts where there is neither energy access nor funds, it is to improve indoor thermal conditions significantly. without added costs. A further consideration for the low income sectors is measures at macro level (urban scale) to address extreme heat events, especially in the cities. We refer here to energy throughout; the carbon (or climate) impacts of housing correspond broadly to those of energy, as long as energy supply systems are largely fossil-fuel based. A reduction of the carbon impact with significant decoupling occurs only if or when a country’s energy supplies are largely renewable. In the context of buildings, a major exception to this is the case of Portland cements, where the chemical process of production (calcination) emits more CO2 than the production energy, and is a large factor in the total lifetime footprint of many constructions. For sustainable buildings we must in addition consider toxicity to humans or the environment that may be neither energy nor climate related (including SO2, NOx, VOCs, formaldehyde, synthetic mineral fibres). Most research and development of low-impact, sustainable buildings has been in temperate and cold climate countries, notably the passive house approach in Europe which has rapidly influenced the state of the art. But there is increasing focus now on embodied energy/carbon, and on issues of energy behaviour; an understanding that technology alone is not the answer. Sustainable building applies similar principles in all climates, though with opposite solutions – for example keeping heat out as opposed to keeping it in. Similarly, priority should in all contexts be on reducing the energy needs (demand side management) before applying best possible energy technologies. However, hot-dry and hot-humid climates pose very different design challenges. So too does a focus on low-income solutions. A third great challenge lies in identifying solutions that suit local cultural and governance conditions. Technically excellent solutions in one country may be may be totally inapplicable in another. We therefore face the questions: how relevant is recent temperate climate research for hot climate sustainable buildings? What kinds of lessons are transferable? What particular opportunities can be found in hot climate developing countries?